Let me just start off by saying, I am not a hot/buffalo sauce person unless it’s in buffalo chicken dip. It’s just not my favorite condiment to use. However, I wanted to try a new chicken recipe because chicken is basically the only meat I eat (no pork or beef for me) and I know poor Daarik gets tired of the same ol chicken three times a week, ha! So, I went out on a limb and tried this recipe out (even though it calls for hot sauce 😮). Guys, I am not joking when I say, this chicken recipe is amazing!!! I let mine marinade all day while I was at work (approx. 9ish hours) and cooked it outside on our grill. Holy guacamole, it was so flavorful and Daarik approved!! 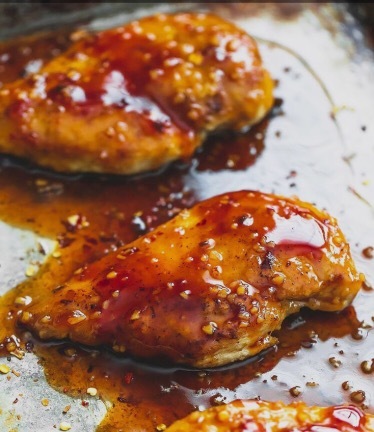 ** Since I knew I was grilling this I whisked together all of the ingredients to make the sauce and poured it over my four chicken breasts (in a plastic container) and let marinade in the fridge for about 9 hours. Below are the cooking instructions from the website just in case you all want to try this recipe but aren’t wanting to grill it!! Preheat oven to 400 degrees and grease a large baking sheet (with a raised side) or casserole dish. In a medium sauce pan whisk together all sauce ingredients. Bring to a boil over medium heat and boil for 3-4 minutes. While sauce is boiling, season chicken with salt and pepper on both sides, grease a skillet and cook chicken on both sides 1-2 minutes over medium heat, just enough to brown the very outside. Arrange chicken in a single layer (not overlapping) on prepared baking sheet. Brush with sauce. (there should still be plenty of sauce leftover – reserve for later). Bake for 20-25 minutes until chicken is cooked through. Pour remaining sauce over the chicken and serve hot.